Great, sweet little spot. Nothing to complain about. An absolutely beautiful Riad, wonderful rooms (with very good showers! ), delicious breakfasts, helpful staff and a lovely little roof terrace. Without a doubt the best place we stayed in in Morocco. Well located. Clean rooms with hot shower. Friendly and helpful staff. We had an enjoyable time staying here, er found it very convenient. Breakfast was good, the staff are very helpful and courteous. Staying here made my first visit to Morroco so enjoyable I want to go back. Great place, EXCELLENT complementary breakfast. Would stay there again. This is a nice riad with a great location. The breakfasts are really nice and the bed is really comfortable. We had some problems during our stay with the shower, it didn’t got warm and didn’t drain well, the staff was very helpful though. It feels a lot like a regular hotel in this riad, there is no hostel feeling. The bathroom was not super clean. 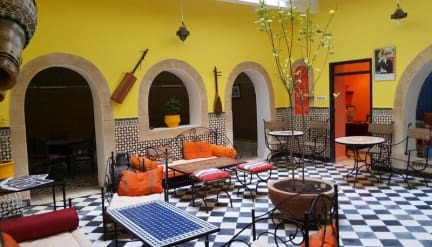 All in all I would recommend this riad for your stay in Essaouira. Terrible! Don’t stay. Many other quaint places! Arrived 20.30 after travelling from the desert, we were exhausted. We arrived to a damp, dark, run down hostel. We were given a room with twin beds that hadn’t been changed for 20 years-I had ordered a double. After an hour we were moved but told we had to change the next day. We had to wear thermals as it was so cold and damp. The tiny window in the bathroom didn’t shut. No hot water. Asked for refund but basically told to shove it by the manager.